A new survey from Abacus Data conducted for QMI/Sun News finds that while a majority of Canadians worry “a great deal” or “a fair amount” about a range of environmental problems, they are more likely to worry about problems that hit closest to home. Respondents were shown a list of seven environmental problems and were asked how concerned they are with each one of them. 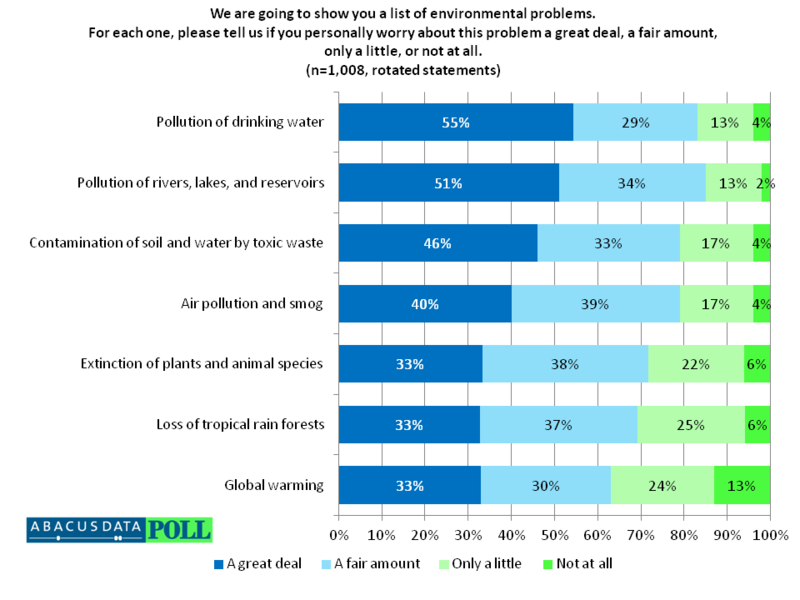 A majority of respondents were worried a great deal about the pollution of drinking water (55% worried a great deal) and the pollution of rivers, lakes and reservoirs (51% worried a great deal). Second tier concerns included the contamination of soil and water by toxic waste (46% worried a great deal) and air pollution and smog (40% worried a great deal). Canadians were comparatively less worried about the extinction of plants and animal species (33% worried a great deal), the loss of tropical rain forests (33% worried a great deal) and global warming (33%) worried a great deal. In fact, when asked specifically about global warming, 37% said they worried only a little or not at all about the issue, much higher than any other environmental issue tested. The survey also found significant variation of opinion by region and political support. Quebec respondents were far more likely to be concerned about all environmental problems than respondents in other parts of Canada. Moreover, while NDP, Liberal and BQ supporters are concerned a great deal by most environmental problems, Conservative Party supporters are less concerned in particular about global warming with only 17% saying they worry a great deal about the issue. The question asked in this survey was mirrored after the exact question asked of Americans by Gallup in April 2012. Gallup has been tracking these measures since 1990. On May 15 and 16, 2012, Abacus Data Inc. conducted an online survey among 1,008 randomly selected Canadian adults from an online panel of over 150,000 Canadians.